Vancouver, BC – July 13, 2017. The British Columbia Real Estate Association (BCREA) reports that a total of 11,671 residential unit sales were recorded by the Multiple Listing Service® (MLS® ) in June, down 9.6 per cent from the same period last year. Total sales dollar volume was $8.47 billion, down 5.6 per cent from June 2016. The average MLS® residential price in the province was $725,778, a 4.4 per cent increase from the same period last year. 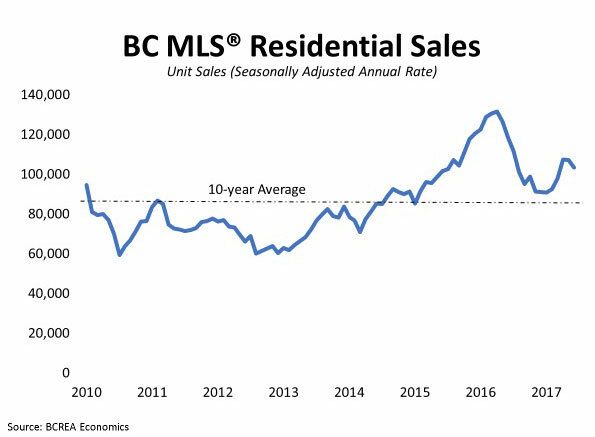 "Although home sales remain well off the record pace set last year, demand is still quite robust," said Brendon Ogmundson, BCREA Economist. "That demand is supported by a strong provincial economy and vigorous job growth."